Our Supported Employment team works with individuals enrolled in our Mental Health and Intellectual Developmental Disability programs by providing Employment Assistance and Supported Employment services. We assist individuals in gaining employment, expanding their job skills and support individuals in maintaining their employment. Our dedicated team is here to help you reach your potential for successful employment. 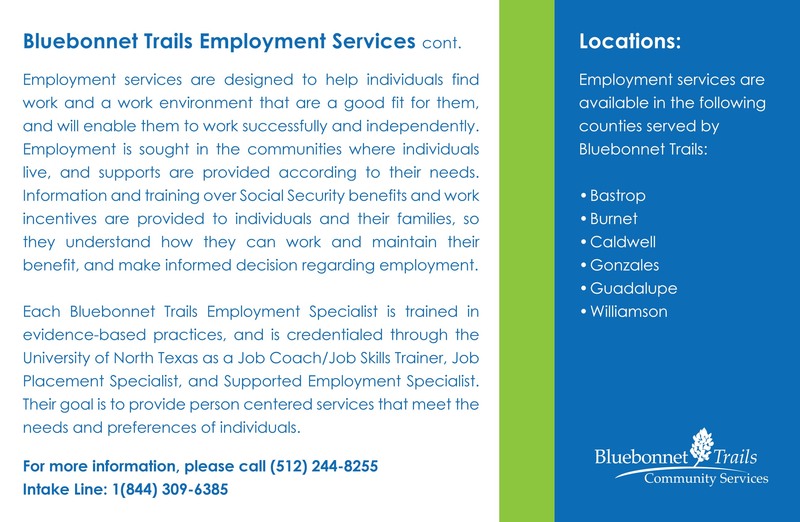 Locations: For those enrolled in our IDD programs, Employment Assistance and Supported Employment can be found in Bastrop, Giddings, Gonzales, La Grange, Luling, Marble Falls, Seguin, and Round Rock. For those enrolled in our Mental Health programs, Supported Employment services can be found in Bastrop, Georgetown, Round Rock, and Seguin. Employment Assistance: Employment Assistance services help individuals secure regular, community jobs. Individuals are assessed to identify their strengths, skills, and preferences. The assessment is used to help individuals find a fit between their strengths and preferences, and jobs in the community. Strategies are developed and implemented to help individuals achieve their desired employment outcome, including more suitable employment for individuals who are employed. Supported Employment: Supported Employment services consist of job coaching, skills training, and supports. It is provided at a person’s job site, and is designed to help a person maintain competitive employment if a person is in danger of losing their job. Supported Employment: Supported Employment services assist a person in choosing and obtaining employment in regular, community jobs. 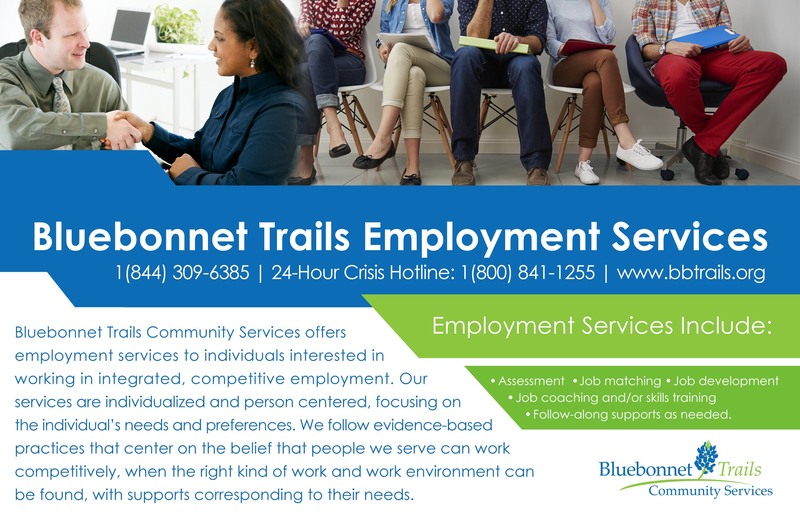 Activities include assisting the person in finding a job, helping the individual complete job applications, advocating with potential employers, and employer negotiations, among other activities. Supported Employment services also include assisting a person to achieve employment stability.